I wanted to create the next Harry Potter series, but I felt it was too big of a project to keep to myself. 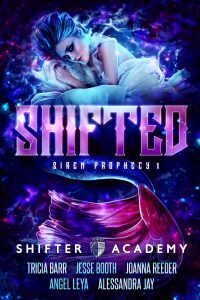 So I invited other authors to create this shifter world with me. We all decided to write one big book together to launch the series, and it's been the best time of my life as an author to write my partners. The book is written by 5 authors, and each author invented a character to write in their point of view. My character is a mermaid shifter because I have always loved the Little Mermaid. “Who are you and what do you want with me?” Myreen hiccupped. “A target to who?” she asked, trying to remain calm. “Who did that to my mom?” Tears welled in her eyes, but she refused to let them fall. “Vampires,” Oberon replied, dead serious. She narrowed her eyes. What was he talking about? “What is she?” Kenzie asked beside her. “Myreen, have you ever experienced anything strange? Anything you couldn’t explain?” Oberon kept his gaze on Myreen in the mirror, ignoring Kenzie’s question. Myreen’s mind flipped through screenshots of her life. There was nothing normal about the way she grew up, but nothing to indicate she was something otherworldly as this man was suggesting. “What about your mother?” he asked. She met his steely gaze in the mirror. Why was he asking her about swimming? Was there really something to the stupid no-water rule? “I’ve never been allowed to swim,” she confessed.